1000BPH semi-automatic water bottling line is working placidly and reliable and easy to operate and maintain have low failure rate. It is a ideal completely filling line for small and medium water enterprises.And it is a very economic for first start. 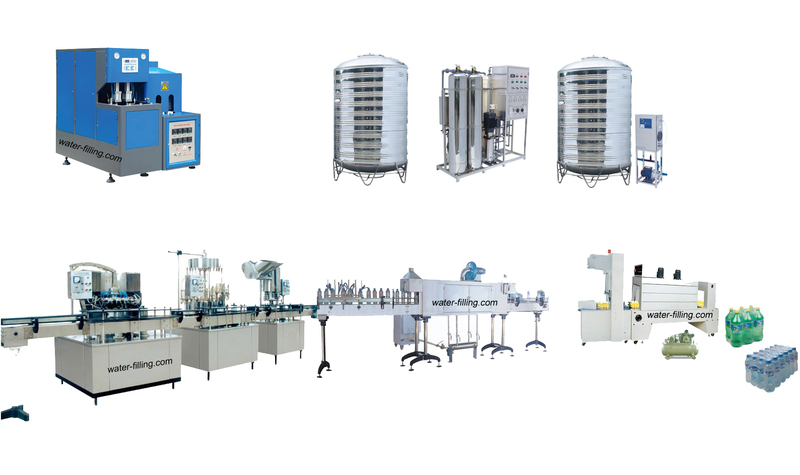 Whole bottling line included bottle blower, water purification, bottle washing, water filler, bottle capping, bottle labeling and package. Product: Pure bottle water, Mineral bottled water, Spring bottle water and other bottle drinks. It is suitable for producing PET plastic containers and bottles from 10-2000ml. RO system for producing drinking water.Removed raw water’s suspended solids, bacteria, algae, viruses, fungi, minerals such as iron, manganese , sulphur, and man-made chemical pollutants. Whole filling line process from washing, negative pressure,filling, settle cap, buckle cap till screw cap. Worker manual labeling the bottle, then the bottle water go through shrink tunnel and the PVC label will get tight on the bottle because of the high temperature hot gas.